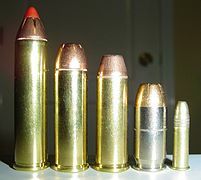 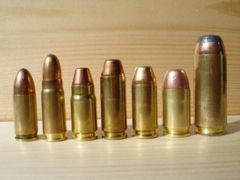 .357-45 GWM (.357/45 Grizzly Winchester Magnum .357 in (9.1 mm) 1.300 in (33.0 mm) - Rimless LAR Reloading Data: Cartridge: "357/45 GWM"
From left to right: .50 Action Express, .44 Magnum, .357 Magnum, .45 ACP, .40 S&W, 9mm Luger, .22 Long Rifle. 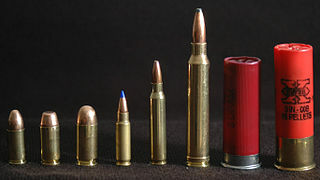 ^ "SwissMiniGun Arme Miniature Miniature Arms". 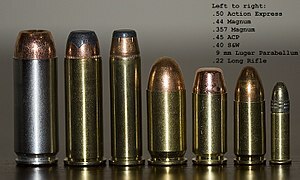 ^ "Firearm Technical Trivia, November 2001".